Cry to the world/That all might understand:/I was once a black clown/But now—/I’m a man! 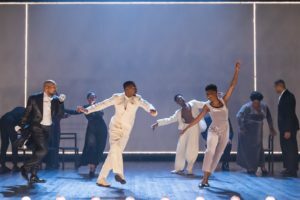 Fusing vaudeville, gospel, opera, jazz, and spirituals, The Black Clown brings Langston Hughes’s famed 1931 poem to life in a stunning new music-theater piece. Powerful and prescient, the experience of a black man’s resilience against a legacy of oppression unfolds, featuring baritone Davóne Tines in the title role. He’s joined by an ensemble of 12 and a chamber orchestra performing a vibrant score by Michael Schachter.